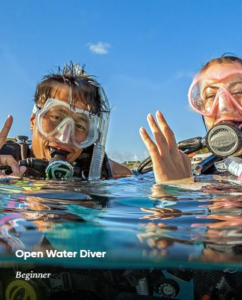 Open Water Class is your ticket to the underwater world! This is how you get certified to go diving for the rest of your life, anywhere in the world (in conditions like you get certified in or better). If you’re already certified and want to continue learning, check out the CLASSES menu at the top of this page! Salem Scuba’s PADI Open Water Diver class is the entry point into this amazing sport of diving! After this class, you’re certified to dive down to 60 feet deep, anywhere in the world (with conditions equal or better than your certification location). And your certification lasts for the rest of your life! Salem Scuba teaches an Open Water class each month of the year, with more pool and open water time than anyone. You’ll get plenty of quality time with your instructor and staff, and by the time you’re done, you’ll be in love with the 70% of the world that was previously off-limits! Your open water class will consist of 4 classroom sessions where you’ll go through the Open Water Diver book and discussions. Then you’ll follow that with 2 seperate 5 hour pool sessions that allow you much quality time to get comfortable with the skills and techniques of exploring the underwater world. Lastly we’ll head up to Washington together to do your open water certification weekend. And Salem Scuba and it’s instructional staff has developed one of the best open water training systems around! So many shops get you the 4 checkout dives required by PADI, then send you on your way, but we know that it’s the first dive where you’re just swimming, going where the impulse takes you and spending whatever amount of time YOU decide looking at the variety of marine life- those are the dives that turns students into lifelong divers! So on your open water weekend, you’ll have the chance to get in more than the regular 4 dives, so that you can possibly dive a wreck, a wall, and most importantly- dive on your own plan with your buddies (don’t worry if you’re signing up solo, you’ll make buddies in the class for sure!) Truly, from more students than we could count, we’ve heard that it’s the bonus dives where they really started seeing themselves doing this more, because it was on those bonus dives they got to relax, follow their own heart and pace, and enjoyed the most. Your training dives will be a blast, no doubt! But the bonus dives have been the highlight of many lives over many years. We like give out all the costs right up front, so here it is: Don’t just take “all-inclusive” to mean it, we’re the best bargain in diving for what we include! -You’ll need a mask, snorkel, fins and boots- each dive starts with spitting in your mask, so you can see why these pieces are a purchase not rent situation. The good news- if you buy gear you really like, many divers buy these items one time for life- because SCUBA quality gear is made to last. And you don’t have to worry about getting the exact right item- Salem Scuba will happily exchange gear till you’re happy. Those have a range, but Dea gives a 30% discount to divers taking the class, so you’ll get $428.60 worth of gear, less 30% = $300.00. -You’ll have gas and food for your weekend in Washington. Of course, we recommend carpooling up and back with folks you meet in your class. It’ll make the trip easier, as well as share the load on gas! -You’ll have to pay for the air fills of your bonus dives- if you do the absolute max, that’s 4 dives beyond the training 4 (8 dives on your first weekend!) and those would be ten dollars each at the local dive shop near where we stay. So dive in! Let’s do this! CONTACT US, and let’s start the journey of a lifetime now! If you’re doing or would like to do your acedmic portion online, click here for the online course system.